Prawn Tempura, Avocado, Cucumber, Yam. 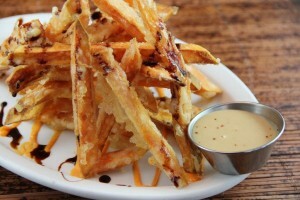 Thin cut tempura strips with home made soy reduction sauce. Mango, Avocado, Salmon, rice crisp with Blackberry Mayo. Hearty chowder with wild sockeye salmon chunks in soup. Cabbage, Carrot, Zucchini, Broccoli, Mushroom, Onion, Beansprouts. 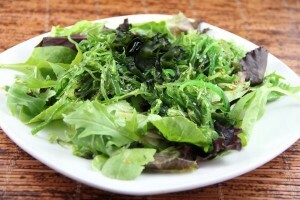 All natural gluten free seasoned seaweed on spring mix. Tuna & Salmon Sashimi on Spring Mix. Seared sashimi, tomato, cilantro, cashew nuts, spring mix, bean noodle served with sweet chili sauce. Diced fresh tuna marinated in special spicy sauce. Lightly seared tuna. Sliced and served with ponzu sauce. 4 pieces Prawn, Avocado, Cucumber, Spring Mix. 3 Pcs Prawn & 5 Pcs Veggie. 4 pcs Tuna and 4 pcs Salmon. 2 pieces Tuna, 2 pieces Sockeye Salmon, 2 pieces Hamachi, 2 pieces Mackerel. Brown Rice Lightly Marinated Olive Oil , Poppy Seeds, Spring Mix, Edamame, Avocado, Cucumber, Tuna & Salmon Sashimi Seaweed Salad, Gluten Free Ginger Dressing. Seared Sashimi: 2 Pcs Tuna, 2 Pcs Sockeye Salmon, 1 pc Toro, 1 pc Saba, 1 pc Prawn, 1 pc Hamachi, Avocado, Ponzu Sauce. Spring Mix, Edamame, Avocado, Cucumber, Mango, Yam Tempura, Tomato, Seaweed Salad. Served with Rice and Miso Soup. 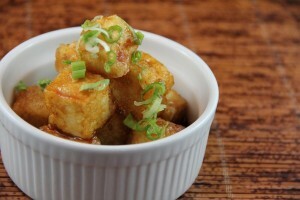 Includes Yam Fry, Organic Spring Mix. Sauteed with herb oil, (Thyme, Rosemary), Served with balsamic soy reduction. Pork, Onion, Coconut Milk, Shrimp Paste, Lemongrass, Lime served with Sweet Chili Ponzu Sauce. Coconut soup base made of Dried Shrimp, chili garlic, lemongrass and turmeric with prawns, scallop, tofu. Cream Cheese, avocado Wrapped with Smoked Salmon. Prawn Tempura, Asparagus & Avocado Topped with Seared Salmon & Gluten Free Teriyaki Sauce. Sockeye Salmon, Avocado, Asparagus topped with Seared Tuna & Gluten Free Ponzu Sauce. Fresh tomato, Cream Cheese, Pesto, Olive, Lightly Sauteed with Olive Oil, Gluten Free Balsamic Soy. Fresh Real Crab, Avocado, Asparagus with Rice Tempura Crisp. 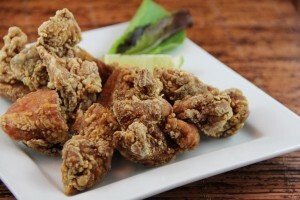 Gluten Free Soft Shell Crab Tempura, Cucumber, Avocado, Lettuce with Gluten Free Teriyaki Sauce. Avocado, Mango, Cucumber topped with All Natural Seaweed Salad. Marinated Artichoke Hearts, Sundried Tomato & Cream Cheese Rolled in Pumpkin Seed & Coriander Seeds Lightly sauteed with Gluten Free Balsamic Soy. Tuna, Sockeye Salmon, Prawn, Cucumber, Avocado with Rice Tempura Crisp. Prawn, Cucumber Wrapped with Tuna, Sockeye Salmon & Avocado. Chopped Scallop, Avocado, Mayo, Tobiko with Gluten Free Spicy Sauce. 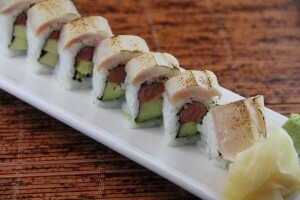 Avocado, Scallop, Cucumber Wrapped with Sockeye Salmon & Tobiko on Top. 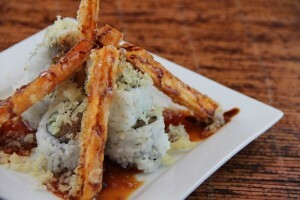 Spicy Tuna, Cucumber, Yum Tempura with Spicy Sauce, Soy Reduction Sauce. Purple Yam, Avocado, Cream Cheese with Crispy Rice Noodle & Purple Yam Tempura & Miso Hollandaise Sauce. Sashimi: Tuna - 3 Pcs, Sockeye Salmon- 3 Pcs, Roll: Dynamite (5 Pcs). Nigiri - Tuna (1Pc), Sockeye Salmon (1Pc), Yellow Tail (1Pc), Prawn (1Pc), Saba (1Pc), Ikura (1Pc), Tamago (1Pc) & Roll : Tuna (3Pcs), Sockeye Salmon (3Pcs). Aburi: - Tuna (1Pc),Toro (1Pc), Prawn (1Pc), Sockeye Salmon (1Pc), Yellow Tail (1Pc), Ika (1Pc), Saba (1Pc). 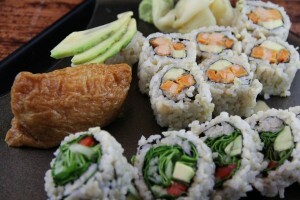 Roll: - Tuna ( 3Pcs), Dynamite ( 5Pcs), Sockeye Salmon ( 3Pcs), Real Crab California ( 3Pcs). Nigiri: - Tuna ( 2Pcs), Sockeye Salmon ( 2Pcs) & Roll: - Dynamite ( 5Pcs). Steamed Broccoli, All Natural Seaweed Salad, Spinach Gomaae, Miso Soup, Agedashi Tofu, Avocado & Mango Salad, Yammy Roll. Organic Spring Mix, Prawn Tempura, Tuna & Avocado Roll, Chicken & Mushroom with Gluten Free Teriyaki, Miso Soup, Gomaae, Agedashi Tofu (6 Pieces). 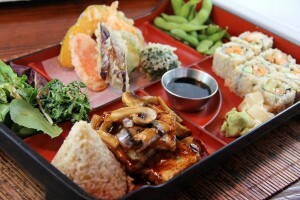 Chicken Teriyaki, Tempura, Edamame, Yammy Roll, Miso Soup, Rice, Salad. Beef Teriyaki, Tempura, Edamame, Yammy Roll, Miso Soup, Rice, Salad. Tofu Teriyaki, Tempura, Edamame, Yammy Roll (6Pcs), Veggie Tempura, Gomaae, Miso Soup, Rice, Salad. Salmon Teriyaki, Tempura, Edamame, Yammy Roll, Miso Soup, Rice, Salad. 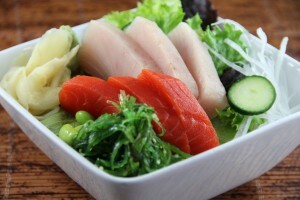 Sashimi: - Tuna (3 pieces) & Salmon (3 pieces), Chicken Breast Teriyaki, Tempura, Edamame, Yammy Roll, Miso Soup, Rice, Salad. Nigiris: Tuna (2Pcs), Ebi (2Pcs), Salmon (2Pcs), Chopped Scallop (2Pcs) & Rolls: BC, Yammy, Dynamite. Rolls: Tuna, Avocado, Yammy, Hell, BC, Salmon Avo, Iki, Dynamite, Crispy Mango. Rolls: - Avocado, Awokyu, Emerald, Veggie, Sundried Tomato, Yammy, Avocado & Mango, Mango.